For those who celebrate Easter, the holiday marks the unofficial start of spring — at least as far as hosting duties go. It’s time to stash away those tartan plaid plates, red-trimmed napkins and snowflake-themed glassware in favor of more spring-friendly styles. While your Easter feast tableware may involve some festive bunny-and-egg designs, we’re mixing in some seasonal staples, like pastel enamel flatware, lilac glasses and retro drinking straws. Shop our ten favorite must-haves for your Easter table, right here. Infuse just the right amount of springtime color into your table setting with a set of tinted glasses. Sure, they’re vaguely Easter-themed, but these animal shakers are adorable all season long. Pottery Barn Antique Bunny Salt & Pepper Shakers, $24, potterybarn.com. Fully immerse yourself in the Easter spirit with a set of bunny-clad dishes, because if not now, when? 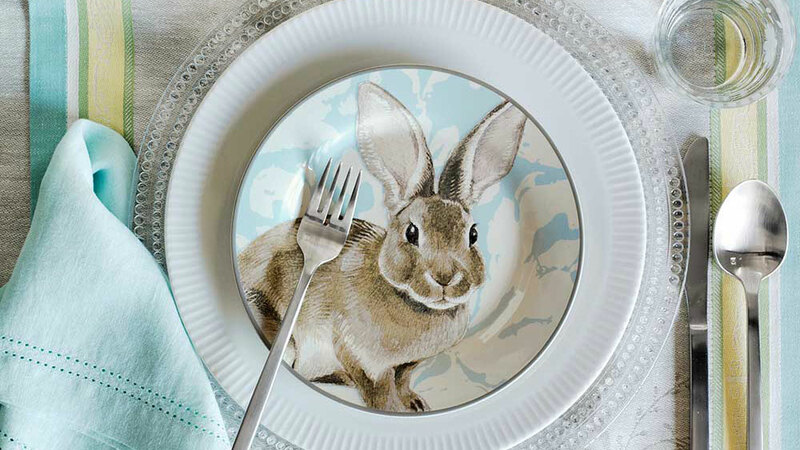 Williams Sonoma Damask Bunny Salad Plates, Set of 4, $47, williams-sonoma.com. Add a crafty element to your table setting by including a set of holiday-appropriate linens with embroidery or embellishments. Sur la Table Easter Egg Napkins, Set of 4, $10, surlatable.com. 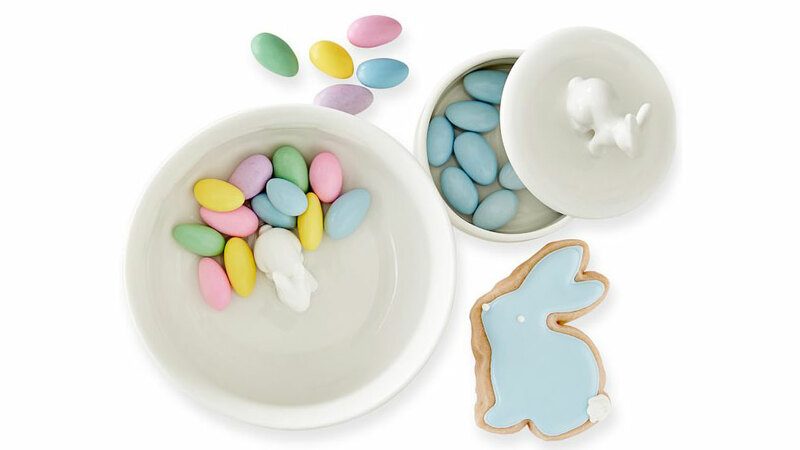 Full of jelly beans, this ceramic bowl may look ordinary to your guests, but once the candy starts disappearing, the adorable little bunny at the bottom appears. Mark & Graham Jelly Bean Hidden Bunny Bowl, $14, markandgraham.com. Easter prints don’t have to be confined to rabbits. Eggs, carrots or even flowers are all fair game this season. 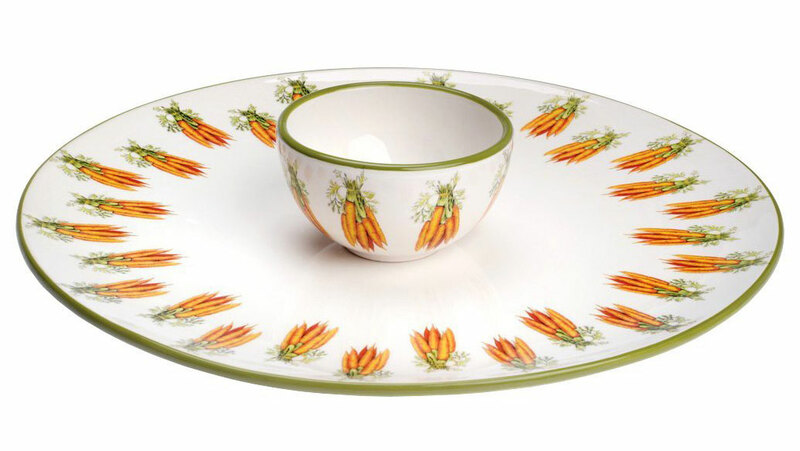 Boston International Eddie and Carrots Ceramic Crudité Server and Bowl Set, $45, amazon.com. Who says the kids get to have all the fun when it comes to colorful place settings? Easter is the perfect time to pull out that colored glassware you love. Pizzazz Set of 4 Drinking Glasses Stemware, $25, amazon.com. Put the finishing touches on your bountiful Easter table with these gold-footed bunny place card holders. BHLDN Bunny Place Card Holders, Set of 6, $28, bhldn.com.